Stump Grinding is the most Safe, Reliable and Tidiest way of removal. We start by clearing the ground around the stump, then cut down the stump as low as possible with a chain saw. 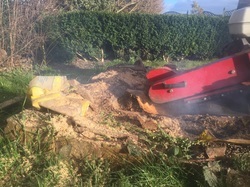 The Stump Grinder is then used to cut the stump below ground level with its fast spinning blade on the front the stump will be gone in no time at all. What happens with the left over chippings? We can use them to back fill the hole or you can compost the mulch and use or put them in your recycle bin or use the as a much around the garden. If you want us to take them away there will be a small extra charge since we have to pay to take them to the recycle center. Will the machinery be able to get in my garden? Our smallest and most used machine is 2 foot 4" wide so will fit through most doorways, gates and even living rooms if access is really limited. How long does it take? It takes 30 - 45 minutes to remove a stump on average, depending on size. Stump Grinding is the most Safe, Reliable and Tidiest way of removal. When we remove a stump we grind it below ground level to get to the nucleolus of the stump, effectively killing the stump and its roots. Other methods or removing stumps are not as effective like stump chemicals. Lots of people have tried to kill off stumps by using stump chemicals you can buy off the shelf in shops, where they drill lots of holes into a stump and pour the chemicals into the holes. In reality this does not work as you can not by chemicals strong enough over the counter and it is also very time consuming. Another popular method of stump removal is by mini digger. 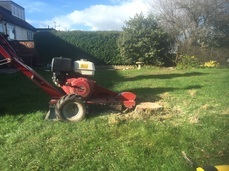 This is a more effective way of stump removal but it has many down sides for example, the digger will make a mess of your grass and surrounding areas, it will pull up the roots of the stump, it may damage underground pipes, cables etc. that may be running above the roots.